On December 31, 1940, Timothy Daniel Considine was born in Los Angeles, California, to a family steeped in the performing arts. 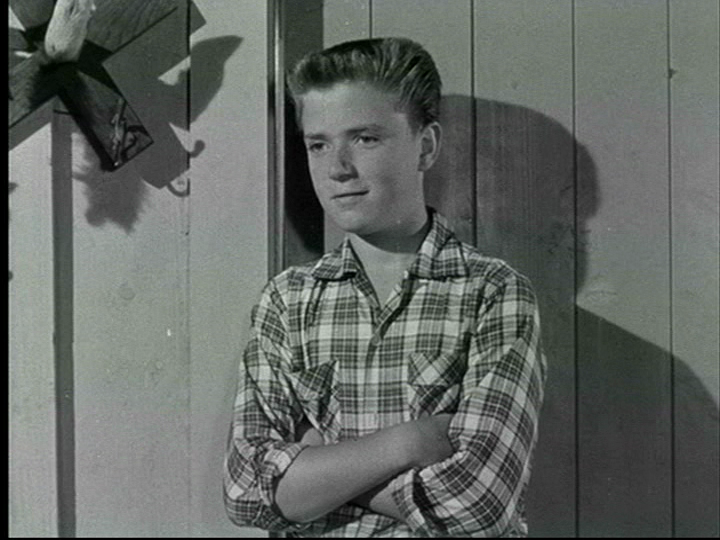 His first role was in the 1953 film The Clown playing Red Skelton’s son. In 1955, Considine was cast as Spin Evans in the Mickey Mouse Club serial “Spin and Marty,” playing alongside friend and fellow Disney Legend David Stollery’s Marty Markham. The serial went on to great popularity, which Considine attributed to being the only live-action series on television geared towards children. “Spin and Marty” would be followed with two further sequels, “The Further Adventures of Spin and Marty” and “The New Adventures of Spin and Marty.” After the first serial, Considine was cast as Frank Hardy in a serial based on the detective novels “The Hardy Boys” alongside Tommy Kirk’s Joe Hardy, and wasgiven a role in the “Annette” serial. In 1959, Considine starred in the Disney live-action film The Shaggy Dog. In the 1960s, he starred on the classic series My Three Sons with fellow Disney legend Fred MacMurray. After a few roles in the 1970s, Considine created a new career for himself by becoming an author and photographer, writing about sports and automotive history. He continues to work as a contributing editor for Road & Track magazine, with his photographs being used in several media pieces. Posted in Uncategorized and tagged Actor, Births, Disney Legend, Live Action, Mickey Mouse Club, Serial, Television. Bookmark the permalink. 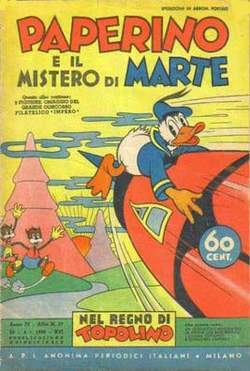 On December 30, 1937, the Donald Duck serial comic Paolino Paperino e il mistero di Marte (translated as Donald Duck and the Mystery of Mars) began publication. The comic was written and illustrated by Federico Pedrocchi, and was the first piece to feature Donald as an adventurer, rather than just a comedic hothead; in this instance, Donald is tricked into entering a spaceship heading for Mars, and is kidnapped by Martians, among other mishaps. This comic was the first eighteen volumes in a series of Donald comics known as Paperino e alter avventure. This is also the first printed instance of Donald’s Italian name, Paolino Paperino. Posted in Uncategorized and tagged 1930s, Comic, Donald Duck, International, Print. Bookmark the permalink. On December 29, 1941, Time Magazine featured a further review of the animated feature film Dumbo, which was released in October of 1941. Critical and public reaction to the film was overwhelmingly positive, and Time Magazine, which had a review of it in October, decided to dedicate the December issue to Dumbo, calling him “Mammal of the Year.” However, due to the events of Pearl Harbor on December 7, 1941, the cover was soon replaced with General Douglas MacArthur, as it was felt that the planned cover might trivialize the struggles of the nation. 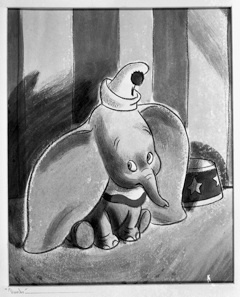 Thanks to Dumbo’s popularity, the section for the elephant was moved to the cinema section, complete with a behind-the-scenes look at the character and his story that inspired a nation. Posted in Uncategorized and tagged 1940s, Animated Feature Film, Popularity, Press, Print. Bookmark the permalink. On December 28, 1997, the best of episode of Muppets Tonight premiered on Disney Channel. The episode was the nineteenth episode of the second, and final, season, recapping memorable moments in the show’s history, and was hosted by Gonzo and Rizzo. The episode was directed by Tom Trbovich. The episode begins with Rizzo having a nightmare about his mother getting caught in a mousetrap, when Gonzo walks in to calm him down. Although the cast has been given the week off, Rizzo did not run the tape of the show they’d recorded before the break, as monster Carl ate the tape machine. To help Rizzo, Gonzo suggests that they host a clip show, which Rizzo agrees only out of desperation. Gonzo soon takes the stage, although he bungles the introduction a bit. 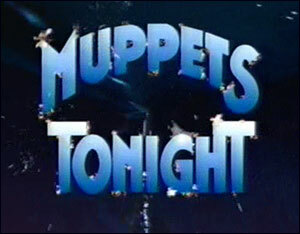 The first clip they run is of Michelle Pfeiffer, who is on a parody of the Love Connection called Muppet Match-Up. This is followed by a clip of Coolio, doing a parody of Milli Vanilli with host Clifford, Cindy Crawford doing a Mouseketeer skit, and Jason Alexander doing a disco dance. The clips continue with some Muppet-specific acts. After these clips, Gonzo promises something “exciting” – and proceeds to blow himself up; Rizzo plays some more clips while he tries to put Gonzo back together. The first clip is of special guest Garth Brooks, who doesn’t want to do country anymore, but switch to a mambo show. The clips follow with Sandra Bullock doing an interpretation of “Mahna Mahna,” Pierce Brosnan being treated like James Bond, Andi MacDowell on vacation with Bunsen, and Cindy Crawford being wooed by Bobo, including other celebrity clips. Rizzo introduces the musical clips with an original composition about not knowing what to say, and then it moves into clips featuring Tony Bennett, Garth Brooks, Coolio, and Prince; the show then moves in to a couple of television show parodies. The show ends with a section known as the greatest “hits,” featuring many examples of slapstick. Posted in Uncategorized and tagged 1990s, Color, Disney Channel, Muppets, Television. Bookmark the permalink. 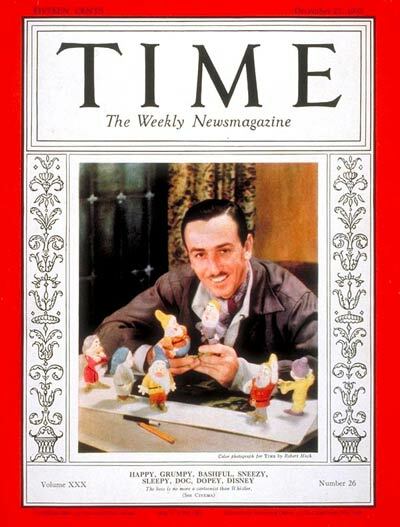 On December 27, 1937, Walt Disney made his first appearance on the cover of Time Magazine. This would be one of two covers featuring Walt, with the second being on December 27, 1954, exactly seventeen years later. Printed nearly a week after the release of the first full-length animated feature Snow White and the Seven Dwarfs, the article talks about the history of the Disney studios leading up to the film’s release, as well as the process of creating a full-length animated feature. Posted in Uncategorized and tagged 1930s, Animated Feature Film, Print, Walt Disney, Walt Disney Studios. Bookmark the permalink. 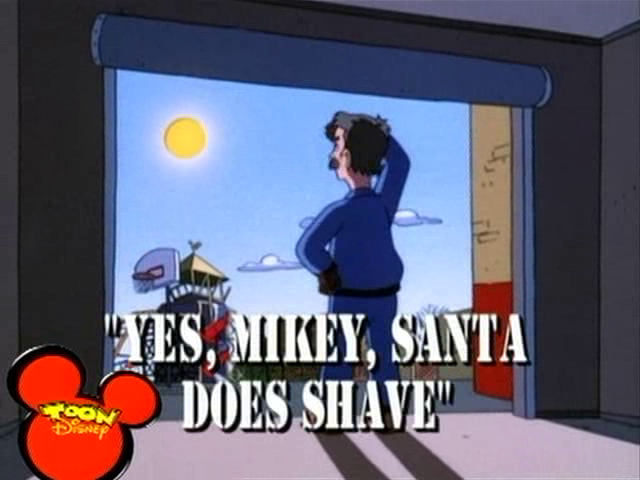 On December 26, 1998, the Christmas episode of the animated series Recess titled “Yes, Mikey, Santa Does Shave” aired on ABC’s One Saturday Morning. The episode was directed by Susie Dietter, and written by Mark Drop, Holly Huckins, and Phil Walsh. The episode begins on December 11th, where the kids are sweating in an above-average heat wave that has hit the area. The janitor Hank believes that there will be a blizzard approaching causing a white Christmas, but the gang doesn’t believe him. The kids then reminisce about Christmas when they were little, but realize that Mikey is the only kid in the gang that still believes in Santa Claus. Mikey then runs off to the Christmas Pageant tryouts, where he wants to just soak up the Christmas atmosphere. The auditions are interrupted by Principal Prickly, who is accompanied by a man from Hollywood looking to find the perfect school auditorium for a “global satellite non-denominational extravaganza.” Prickly almost loses the man, when he decides to use Mikey to sing, as he has a great voice. Mikey is then picked to play Santa, and decides to invite Santa to the show. Randall overhears the discussion, and announces quite cruelly to Mikey that Santa doesn’t exist. Mikey is furious, especially when he finds that his own friends don’t believe in Santa, and sets out to prove that Santa is real. Later, Mikey rejoins his friends with a large stack of books as evidence that Santa exists. It gets worse when Mikey believes that there’s a global conspiracy to say that Santa isn’t real. Mikey then heads to the mall to meet Santa, but the “Santa” loses his temper and yells at the kids. They then head to the Christmas parade, and Mikey runs into the middle of the road, stopping the parade to ask Santa for proof. Unfortunately, the hat and beard fall off, revealing the mayor in disguise. Mikey then heads to the radio station after hearing Santa on the radio, only to find an actor pretending to be Santa. Heartbroken, Mikey heads home, realizing there’s no Santa, and decides not to be in the pageant. Late that night, Mikey wanders around town, dejected, when a man greets him from a porch of a nearby nursing home. The man convinces him that Santa exists, as long as he has faith. Back at the school, the pageant begins, and Randall is standing in for Mikey, although Randall passes out from stage fright. Just in the nick of time, Mikey appears to sing, and it starts to snow outside. The kids all rush outside afterwards to play in the snow, and Mikey sees the old man again, who congratulates him for a job well done. When Mikey asks how the old man knew about the show, the man says that Mikey had invited him, and hands him Mikey’s letter to Santa, which is now whole after being ripped up earlier. The kids are shocked when they realize that they really did just meet Santa, who flies away into the night. Posted in Uncategorized and tagged 1990s, ABC, Animated Series, Christmas, Color, One Saturday Morning, Television. Bookmark the permalink. 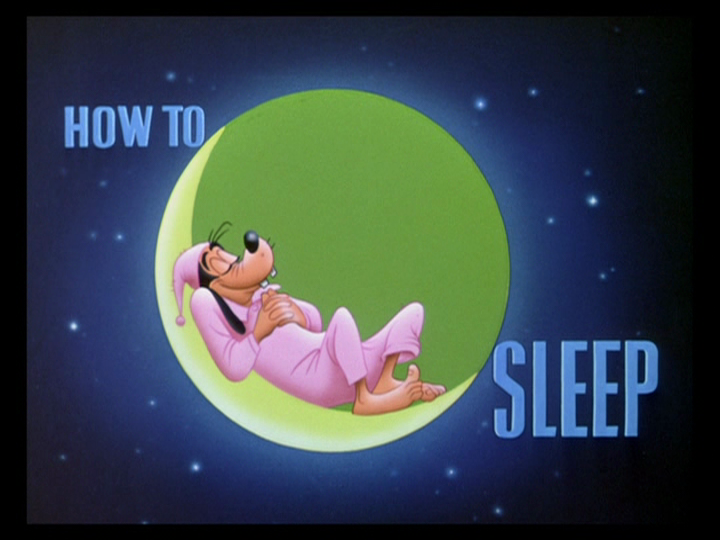 On December 25, 1953, the Goofy short film How to Sleep was released to theaters. It was directed by Jack Kinney, with story by Milt Schaffer and Nick George. The short begins with the history of sleep – or, rather, the lack of it. For present day, they observe various ways people try to go to sleep, from being walked to being rocked. More and more people seem to have difficulty trying to sleep due to the demands of their day. The short then goes into various methods to help people sleep, including hot milk and opening a window. As Goofy tries to count sheep, this only makes his situation much worse. He then has to go see a scientist to help him find the best way to sleep using a variety of electronic devices all at the same time. Unfortunately, his dreams continue to keep him awake. In conclusion, the only way science has determined to put Goofy to sleep is to use a giant mallet over the head, effectively knocking him out. Posted in Uncategorized and tagged 1950s, Color, Goofy, Short film. Bookmark the permalink.